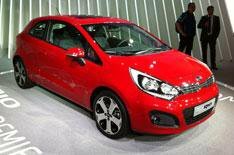 Kia Rio 3dr, new-look Soul | What Car? Kia has revealed its new three-door Rio and face-lifted Soul models at todays Frankfurt motor show. The Rio 3dr is the same size as the five-door version launched earlier this month, and comes with the same engine line-up: two petrols (a 1.25 and a 1.4) and two diesels (a 1.1 and 1.4). Both variations will be available with the same trim levels in most European markets, too. Running costs should also be pretty similar, with CO2 emissions expected to be as low as 85g/km and fuel consumption as good as 88.2mpg in the EcoDynamics model. UK prices have yet to be released, but we expect the new Rio 3dr to cost a bit less than the equivalent five-door. The Soul has been given a face-lift, too, with its longer length and redesigned lights being the most obvious changes. Inside, the centre console has been revised and new interior trims are available to choose from. The engine line-up has also been refreshed, with a new 138bhp 1.6-litre petrol engine joining the 126bhp 1.6 diesel. Youll be able to choose between a six-speed manual or automatic gearbox for both engines in most European markets. The optional EcoDynamics pack will cut CO2 emissions to 139g/km for the petrol, and 125g/km for the diesel. Both the face-lifted Soul and new three-door Rio will go on sale early next year.